The public protector, however, appears to agree with Zuma that Madonsela went too far when she involved the chief justice. Public protector Advocate Busisiwe Mkhwebane said in a radio interview on Tuesday morning that, while she understands that President Zuma has the right to challenge her predecessor’s State of Capture report, she is of the view that Zuma has been inconsistent in his approach. She was responding to a question on whether Zuma’s application to review the recommendations of Adv Thuli Madonsela is legalistically sound, as he alleges the former public protector “overstepped the bounds by recommending a full of commission of inquiry headed by a retired judge”. Mkhwebane announced that the primary reason for the timing of her decision was because she was “seeking legal opinion, as the matter involves six state-owned entities and involves a lot of work”. “After a discussion with the legal team we agreed that we will oppose the president’s review. It’s not only the president, Minister [Mosebenzi] Zwane is also challenging the report. Our reasons for opposing the president’s court action will be revealed in the affidavit at the right time,” Mkhwebane told Radio 702. Mkhwebane addressed Zuma’s statements on the report into looting of state entities involving the controversial Gupta family, suggesting the president might be sending contradictory messages. Asked for her opinion on the argument raised by both Zuma and legal pundits that Madonsela may have over-reached in directing the head of the state on how to institute the commission, Mkhwebane confirmed that she shared the sentiment but preferred that the courts rule on the matter. “I am not ceding legal grounds to the president. There are various issues raised in the president’s affidavit. One being that she [Madonsela] can’t delegate her powers to a commission of inquiry. We would like to have constitutional confirmation. He also raised the issue of conflict of interest … he said you can’t be a judge and a prosecutor in the same matter,” she said. Mkhwebane intimated that the instruction from Madonsela on the chief justice needing to appoint the head of the commission was unnecessary, instead arguing “we need to have confidence in our judiciary. My view is that whichever judge is appointed will do their job objectively. Which is why I am saying that let’s go to courts” so the issues can be ventilated thoroughly. 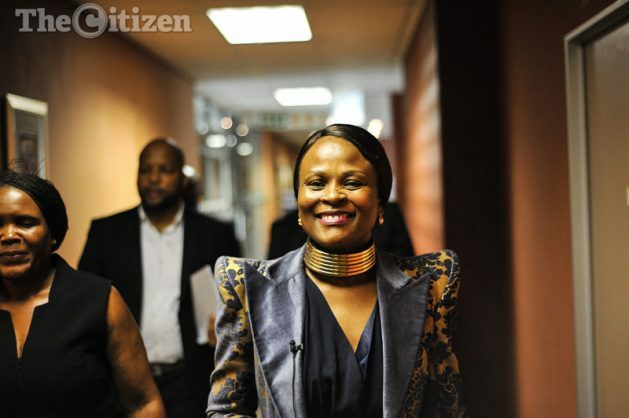 The public protector defended her decision to embark on “preliminary” investigations on follow-up state capture complaints brought by the EFF and Casac, saying that to effect a full investigation, detailed documents were needed to circumvent the need to request the same information from those implicated or being investigated.